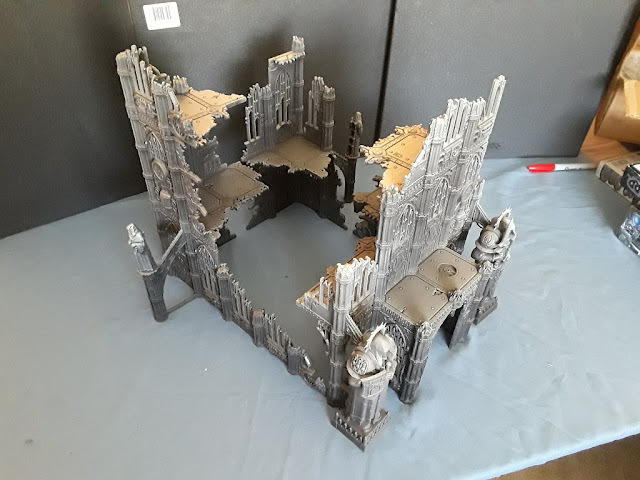 Mordian 7th Regiment: Terrain - Ministorum Temple begins! After working on a fair few individual models, I had the urge to switch scales for a bit and do something big! 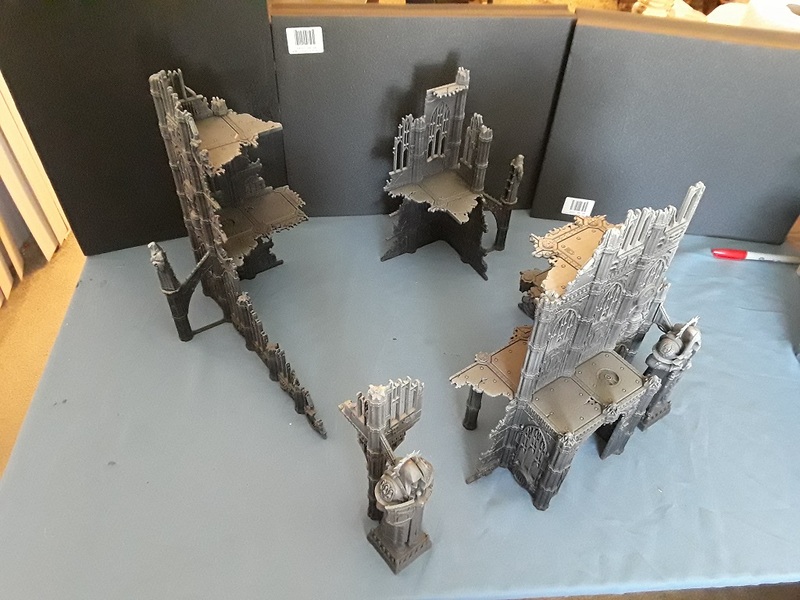 When Killteam was announced I was rather interested in the new buildings that came with it, and though I ultimately decided against buying the starter box I couldn't help but order up a couple boxes of just the terrain! 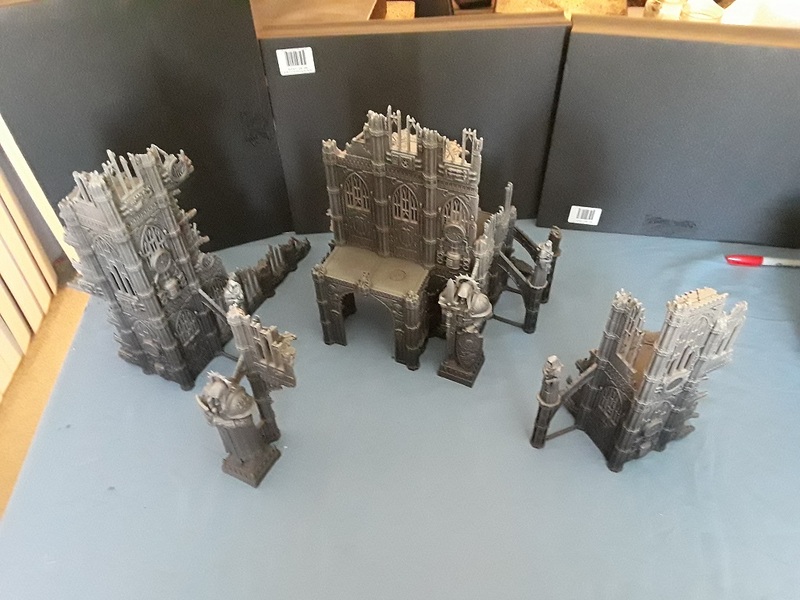 I knew that I wanted to combine the Basilicanum and Sanctus kits into one big Ministorum Temple and though I was initially miffed that the wall heights were different from the earlier City of Death buildings, I have to admit that I'm really impressed with the kits one I got my hands on 'em! I figured that for utility and storage that I'd do it up in multiple sections that fit together into one cohesive building, but could also be used separately and as such it breaks apart into 3 standard "ruined corner" sections, and one little sniper perch. I started the painting process via a bunch of rattle-can primers, beginning with an all-over black primer than progressively lighter browns and tans using the zenithal method to lay in the initial shading. Will have to break out the big brushes soon and start laying in all the detail! These new kits are so good. I got the two big ones to put together after nova! Nice! My only issue was they don't come with enough floor sections in my opinion - I ended up snagging two more frames of floors off eBay. Yeah, for both the Sector Imperialis and the Sector Mechanicus line, I really find myself wanting more floor/walkway sections. I may have to turn to eBay myself. Looks good! I love that modularity aspect of it. How well you can do something that makes a coherent whole, but can also split apart like that. Can't wait until I get my OFCC Army done and I can really dig into these Terrain kits. They really are great kits, and seemed to go together a little easier than the old CoD buildings. Definitely imposing! Oh, also, Ray Dranfield, the guy who designed both these and the Sector Mechanicus line, has some great tips and tricks up on his Twitter. Have a look for it, it's good stuff. That's a nice build! Those new terrain kits have a lot of verticality to them. Indeed! Each wall section is about 5" high so the whole shebang is pushing 18" or so! Nice planning, I’d do the same, make halves or quarters to fit smaller skirmishes or terrain builds. 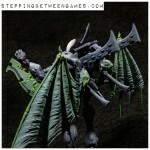 Looks good, nice height for even Knight sized LOS blocking and even give some flexibility to hide from 28mm 40k Titans! Cheers man! Aye, they definitely do a great job of LoS blocking! Eventually, I plan on picking up one each of the Sector Imperialis kits (except the small ruins one) to be able to add to my Kill Team starter box. :) It all just looks so well done. Far prefer it to the Mechanicum sets, though they are nice too. Rattle cans eh? I need to get a bit braver and try those out aside from basic priming. For sure - They're great kits (other than the "needs more floor sections" issue). The rattle cans was definitely experimental, lots of super light passes from 1-2 feet away from a 45 degree angle above until the colors started to show. Think it'll do, but may require some cleanup! The more I look at that kit the more I want it. I love how yours is turning out! I am digging it as well! Kinda wish they'd gone with a scale that would have allowed the integration of the old City of Death kits, but whatchagonnado? Coming together nicely there. The new terrain is rather tempting me but I shall resist and paint up stuff to play on it first.